If you’re in the travel and tourism business you know that the Internet is one of the very first places visitors turn when planning their vacation. Prospective visitors to your resort or travel destination want be able to easily find key information on your website and visualize their stay with you. In order to attract and convert visitors into paying guests it is critical that your website design brings together a number of key factors in order to immediately engage visitors, present a positive image and generate business. 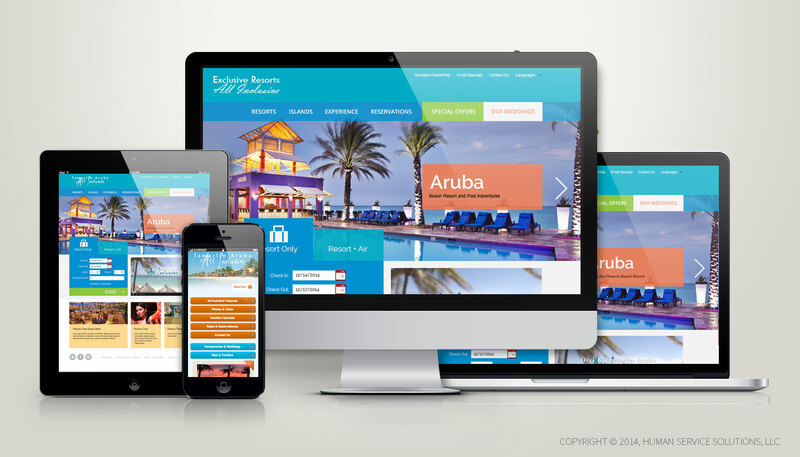 Addressing these key elements ensures that visitors to your website will have a positive experience, and increases the probability that more travelers will book a reservation at your resort or travel/tourism destination. The Internet influences people's travel decisions, plain and simple. If you search ‘resorts’ on Google, you’ll find nearly 151 million different results. The demand for what you provide is there; let us help you you tap into it. Unlike any other medium, a well-positioned tourism web design strategy facilitates the exchange of information and ideas – from the words you write to the pictures you present. By creating a site that presents your brand as both desirable and differentiated, you can instill a sense of confidence in the consumers exploring their travel options. Human Service Solutions’ travel and tourism web design and development strategies bring together all of the best features of your brand into a meaningful whole while presenting a clear call to action. That results in a better online experience that inspires you visitors and converts them into guests. Make Human Service Solutions your destination for your next website design project, and we'll make sure your visitors select you as their travel destination. Who Benefits from Tourism Website Design?